Extra Long Curtain Backdrop! 83" Long! 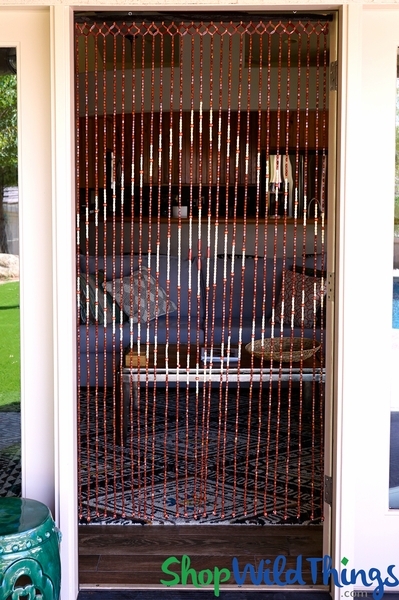 What an awesome addition to our exquisite line of wood beaded curtains! Our "River II" Beaded Curtain is stunning and loaded with wood beads that are arranged to form a gorgeous pattern that will complement any Decor style! The black head rail is 35.25" wide and has 2 eyelets for immediate hanging. 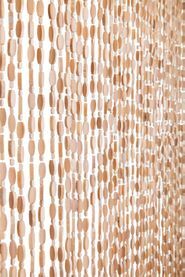 There are 52 strands, spaced about 1/2" apart and the eye-catching pattern is created from ivory, cream and brown wooden beads in varying shapes that give this curtain texture. Each strand is 82" long and the header is 1" so this entire curtain is just 1" shy of 7" long! Beaded curtains are a popular item to use as room dividers, wall hangings or to use as backdrops for parties and stages. The natural colors and the ease of hanging them straight out of the box make them a quick way to add some spice to any room - hanging loose or tied back! The bottom of each strand is finished off with a brown wooden cylinder bead. Natural materials are not perfectly exact so expect some slight variances in the strand lengths.